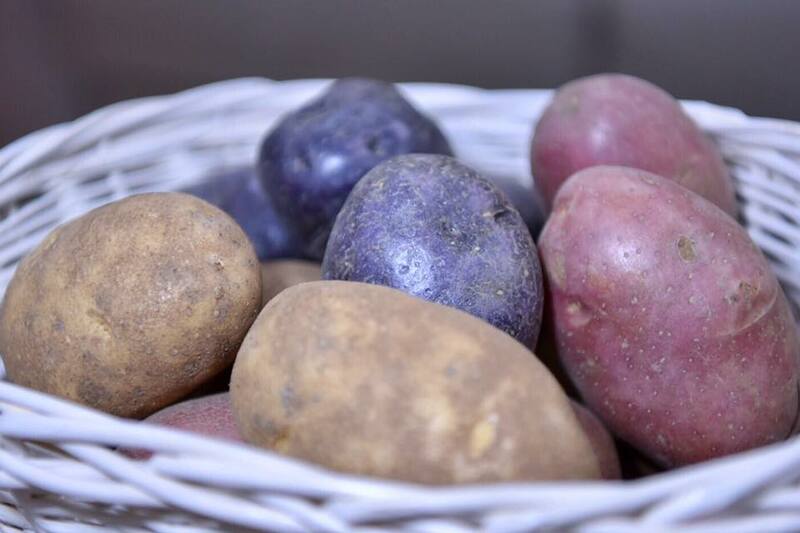 U.S Russet, Purple and Red potatoes. 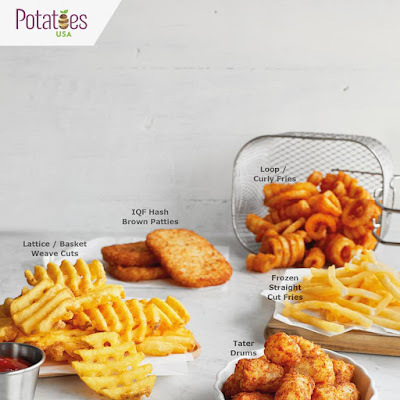 Besides fresh potatoes,there are many different varieties of U.S frozen potatoes such as lattice/basket weave cuts, IQF hash brown patties, loop/curly fries, frozen straight cut fries and tater drums. 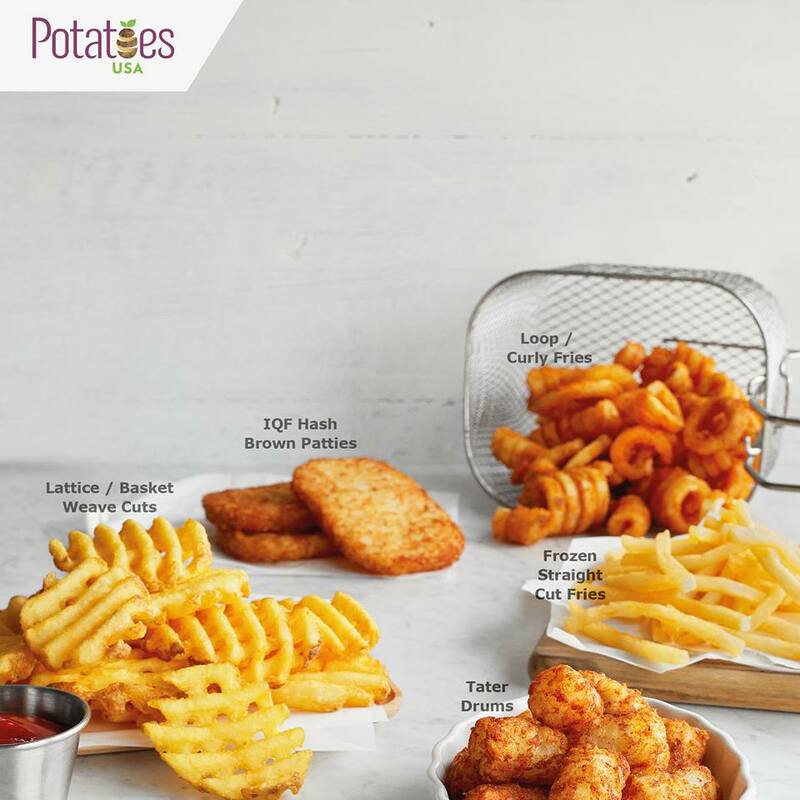 The U.S processors use state of the art technology to meet high industry standards, thus the finished product is instantly quick-frozen to lock in flavour and nutrients of fresh potatoes. No matter U.S fresh or frozen potatoes, it can be easily prepared under 30 minutes for a quick and healthy meal to fuel your body and brain throughout the day. 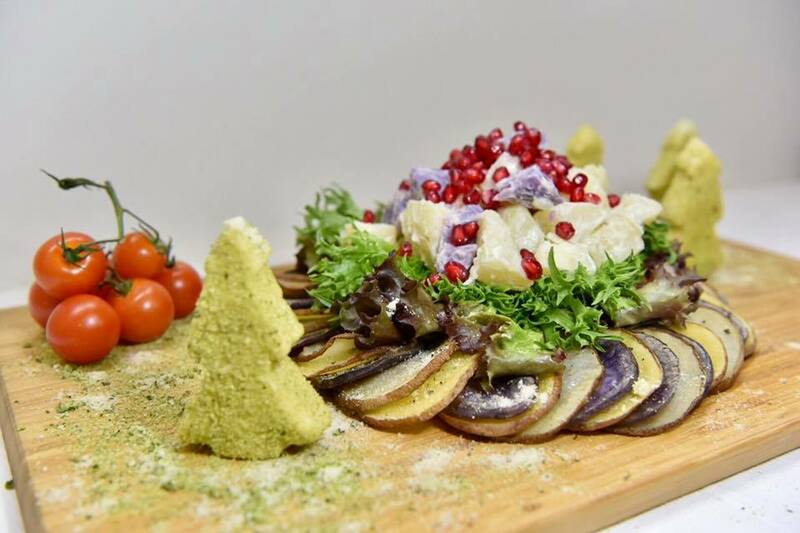 This Christmas, why not take a break from turkey, and indulge in a healthy and delicious Christmas inspired potatoes spread. 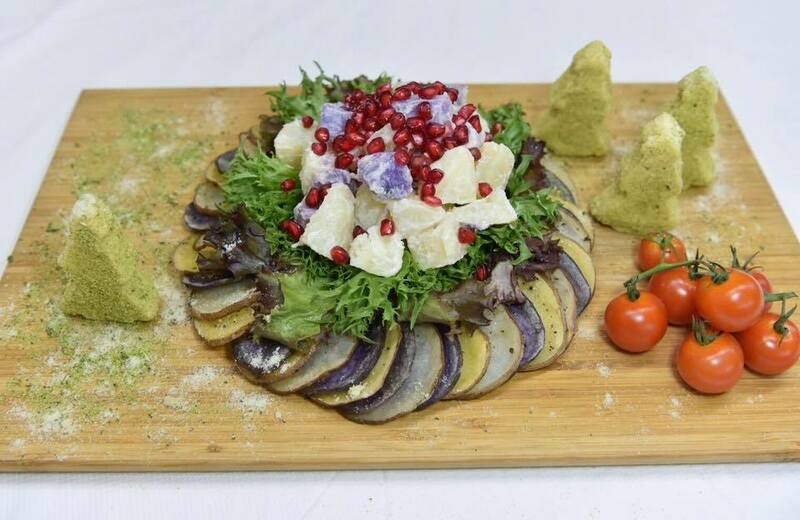 The different varieties and colours of the potatoes, make them the perfect healthy ingredients to awe your guests. 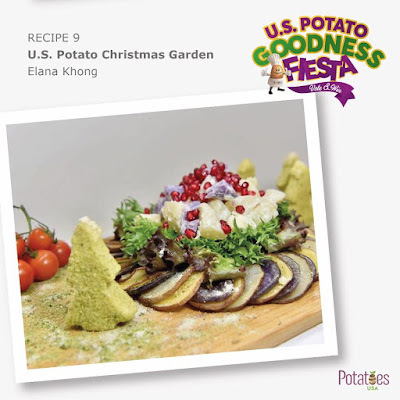 Last two weeks, we were busy in the kitchen and got our creative juices flowing to create this crowd pleasing festive U.S Potato Christmas Garden. 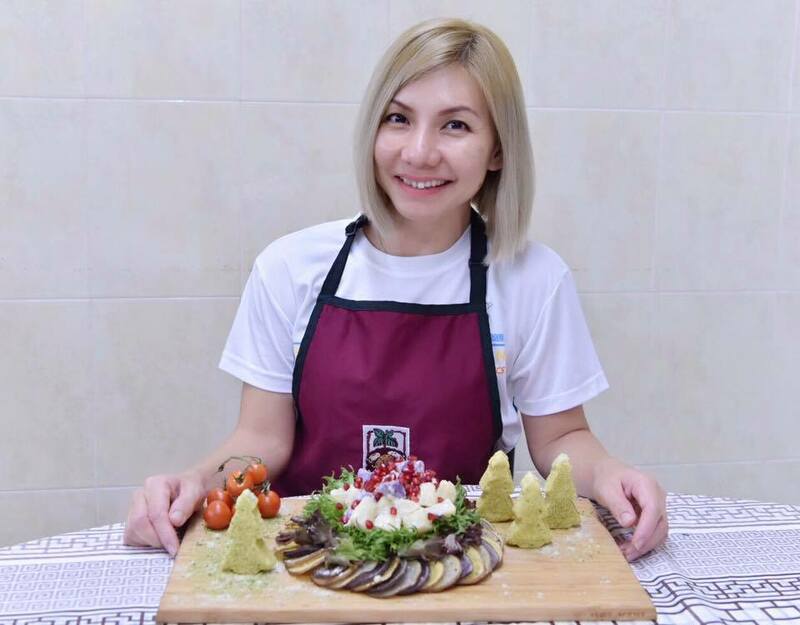 Trust me, it's not only pretty, but also delicious and healthy too, plus it's simple to make. Hehehe... Let me share with you the recipe. 1) Clean and sliced the potatoes. 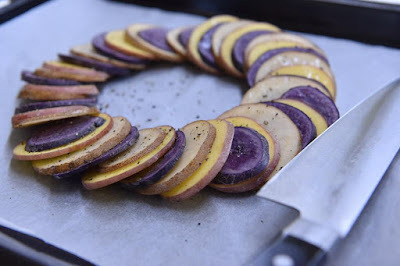 2) Form a circle with the sliced potatoes. 3) Season with salt and pepper and olive oil. 4) Bake at 200C for 15 minutes. 1) Steam the potatoes for 10 minutes, peel off the skin and cut into cubes. 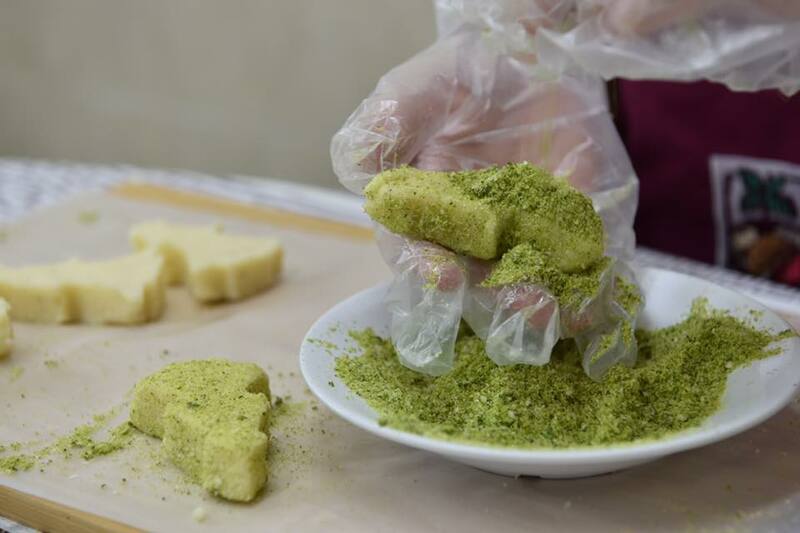 2) Mix sesame seed sauce, lemon juice and salt in a small bowl until well combined. 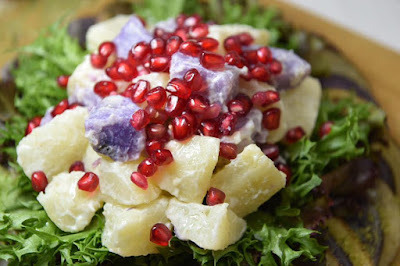 3) Pour the dressing over the potatoes, toss well and top with pomegranate. 1) Add potatoes into a pot of salted water and boiled for 10 minutes or until the potatoes fall apart. 2) Drain and return them to the saucepan, cover with a clean dishtowel for about 5 minutes. 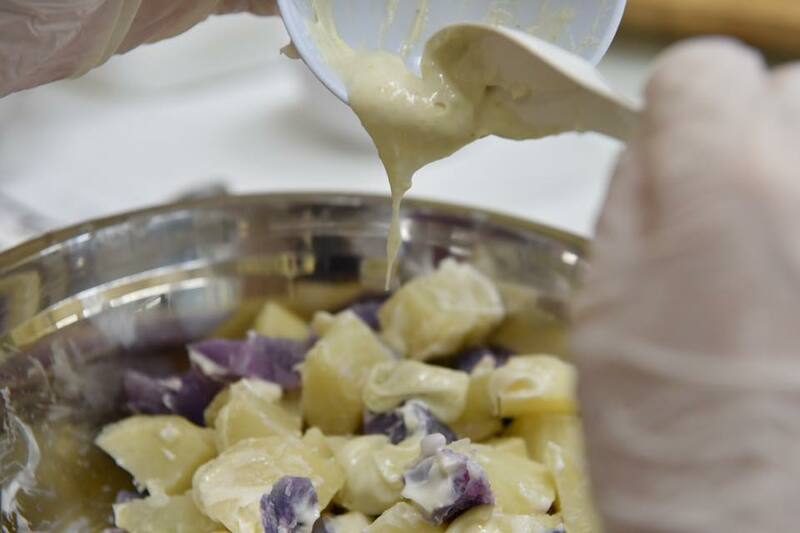 3) Heat milk and butter, pour in the mixture and mash the potatoes until creamy. Stir in pepper and salt. 4) Let stand for 5 minutes and put the mashed potato into the Xmas tree mold to shape. 5) Meanwhile, mix well breadcrumbs and parsley. 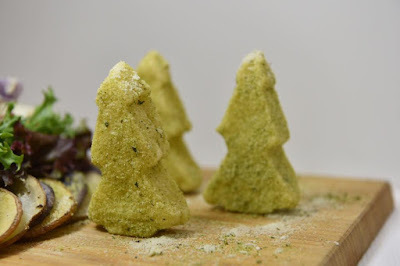 6) Coat the Xmas tree mashed potatoes with breadcrumbs. 7) Bake at 220C for 10 minutes. So simple right? If I can do it, so can you. Impress your guests with this beautiful wow-worthy U.S potatoes creation. From baked russet, red and purple potatoes slices, tangy and fruity pomegranate potato salad, to the pretty and tasty mashed potato Christmas trees, this is definitely a crowd pleasing festive potato garden for this festive season.